An adverb is a word/a set of words that modifies verbs, adjectives, and other adverbs. It tells when, where, and how an action is performed or indicates the quality or degree of the action. Many adverbs end in -ly but some words which end in -ly(such as friendly) are not adverbs. Many words can be both adverbs and adjectives according to their activity in the sentence. Adverb Clauses and Adverb Phrases are clauses and phrases that modify the verbs, adjectives or other adverbs in the sentence. A conjunctive adverb connects phrases or independent clauses. It provides transitions between ideas and shows relationships. Conjunctive adverbs are also called connectors. It rained last night. Nonetheless, the final match has not been canceled. We are still confused, however, if the umpires will come. Last season there was a great drought; consequently, we could not grow crops. A sentence adverb starts the sentence and modifies the whole sentence. Hopefully, we will win the match. Apparently, the sky is getting cloudy. Certainly, I did not think of coming here. Adverbs of time/frequency indicate time or frequency of the action in the sentence. They answer the question ‘when/how frequently is the action performed?’. Always, never, often, eventually, now, frequently, occasionally, once, forever, seldom, before, Sunday, Monday, 10 AM, 12 PM, etc. are common adverbs of time/frequency. I went to school a little late yesterday. He always gets a good result. I will leave on Monday. Adverbs of place/direction that indicate place/direction of the action in the sentence. They answer the question ‘ where is the action performed?’. Across, over, under, in, out, through, backward, there, around, here, sideways, upstairs, in the park, in the field, in that place, etc. are some common adverbs of place/direction. I went through the jungle. He plays in the field. Alex is going to school. He is staying at my home. 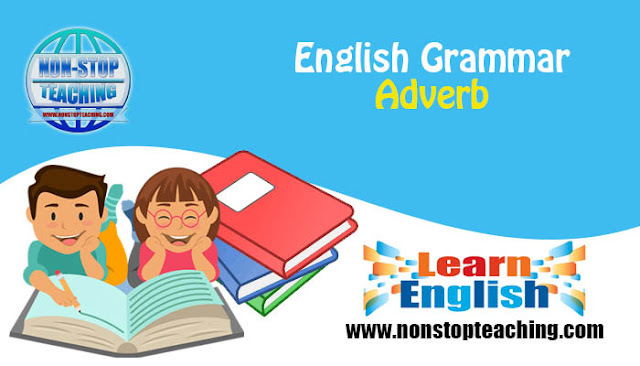 Adverbs that express the importance/degree/level of the action in the sentence are called adverbs of degree. They answer the question ‘how much is the action performed?’. Completely, nearly, entirely, less, mildly, most, thoroughly, somewhat, excessively, much, etc. are common adverbs of degree. She completely forgot about her anniversary. I read the newspaper thoroughly. I am so excited about the new job. Adverbs that express the manner/approach/process of the action in the sentence are called adverbs of manner. They answer the question ‘how is the action performed?’. Beautifully, equally, thankfully, carefully, handily, quickly, coldly, hotly, resentfully, earnestly, nicely, tirelessly, etc. are common adverbs of manner. These adverbs usually end in ly. Let's divide the prizes equally. Please, handle the camera carefully. An adverb is a word/a set of words that modifies verbs, adjectives, and other adverbs. It tells when, where, and how an action is performed or indicates the quality or degree of the action. Many adverbs end in -ly but some words which end in -ly(such as friendly) are not adverbs. Many words can be both adverbs and adjectives according to their activity in the sentence.